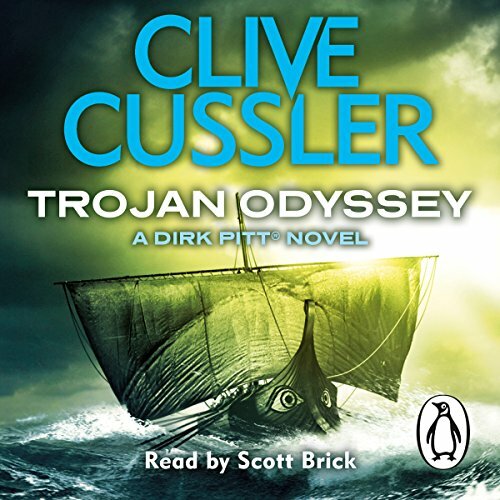 The unabridged, downloadable audiobook edition of Clive Cussler's dark adventure, Trojan Odyssey, part of the thrilling Dirk Pitt series. Read by the award-winning narrator Scott Brick. Dirk Pitt battles his most dangerous foe ever - with help from a very unexpected source. Classic Dirk Pitt Tale just not the best. Would you listen to Trojan Odyssey again? Why? Not for a while. Good story, but wasn't a nail biter. The predictability was a little too much. Al will always be my favourite. The narrator was fine but there were a few audio glitches that detracted from the performance. Pushed through to the end. another great Dirk Pitt story good easy listening. I enjoyed the twisting plots. . . The volume of the recording will randomly change. The editing is odd sometimes like someone forgot to pause between a chapter end and the next chapter. It’s incredibly off putting and I would have given up if not for the story. To be honest it’s not one of cusslers best, but it has a lot of overarching series story. I’d recommend actually reading this and not buying the audiobook. The historical references alone give rise to interest, but as ever Cussler maintains the pace to keep you enthralled. The dubbing effects of the audible not too great on this story though. A background hiss and sudden breaks. A small negative to an outstanding listen. A great story from Cussler as always, but this sounds like it was recorded in a busy office, not anything resembling a voice over booth. the background noise is very distracting at times, and the lazy editing has the lady sentence of one chapter running into the title of the next. I really enjoy Clive Cussler stories but this one did go on a little longer than it needed to (IMO). Also the audio chapters are out of synch from the chapters in the app making it hard to keep track of your progress.